Can a Multivitamin prevent cancer? Studies have shown that a multivitamin prevents cancer. Yet, there were other studies that showed Vitamin E did not prevent prostate cancer and Vitamin A increased mortality. When looking at any study, it is important to determine the population that was studied as well as the dose and form of the supplements. The conflict in these studies may be due to the use of synthetic forms of Vitamin A and E in the studies that showed a poor outcome. 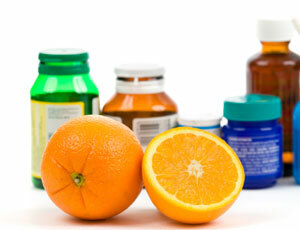 Synthetic or isolated forms of Vitamins A and Vitamin E (alpha tocopherol) have been shown to be harmful. The Standard American diet is deficient in vitamin and minerals so a supplement may be warranted to obtain optimal levels. Look for Vitamin E as mixed tocopherols and Vitamin A as mixed carotenoids. Get most of your nutrients from food and supplement with a high quality, natural multivitamin and mineral formula. Use doses and forms that studies showed were effective. Many factors contribute to overall health and lifestyle plays a much larger role.